Accretionary Wedge #16: Is One Life Enough? I am pleased to host February's Accretionary Wedge Geoblogosphere Carnival! I am impressed and gratified by the contributions; it is wonderful to learn of the fascinating places of our planet, brought to you by those who know and love them. It was my hope that there would be a good sampling of international sites and localities (the original list of 100 sites was fairly North America-centric), and I was not disappointed. The pictures in this Wedge are from the contributors unless otherwise noted. The very first post was from Ikenna, a new geoblogger from Nigeria who offers us the Inselbergs of Nigeria. Check Ikenna's blog for some nice views of a variety of granite domes that dot the terrain in that region of Africa. Darwins Outcrop-Capetown, South Africa, where he proved the igneous origin of granite. Renee Aubrey, a high school teacher in New York suggests in an e-mail that Newfoundland is beautiful! She would add to the list two places from there – sunrise at Cape Spear (easternmost point of North America) and a visit to Western Brook Pond (landlocked fjord). She also suggests sunset from the top of Mauna Kea in Hawaii. Eric at Dynamic Earth offers up the Wadi Al-Hitan in Egypt (I'm thrilled that we got so many suggestions of sites in Africa). The World Heritage Site is both scenic and full of important fossils. Read about it here. Visit the type area of my favorite formations. Do a Powell and travel the length of the Grand River system by boat. See lava coming out of the earth. This need not be a significant event. See a surging glacier if there are any left. Feel an earthquake, again this need not be a major event. Spend a summer at the INSTAAR field camp. If I may editorialize a bit, that would be one heckuva year! Excellent descriptions and photographs can be found at his post here. Check them out! Mel, at Ripples in Sand breaks the rules too (what is it about geologists and rules? But, hey, go for it!) and suggests a comprehensive list of the world's great deserts. Her idea has the benefit of expanding our list to all of the continents (don't forget there are polar deserts, too). 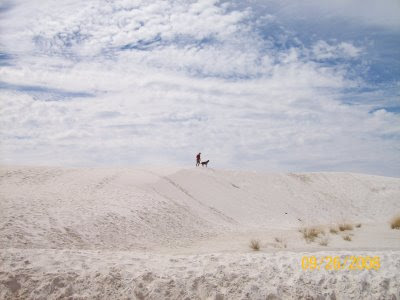 He also has a nice list of dune fields that he has visited, including White Sands, shown below. 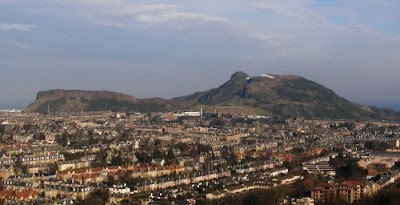 See his post for some excellent descriptions of his adventures as well as some very nice photos, including Arthur's Seat and the Salisbury Crags in Edinburgh, Scotland (shown below). 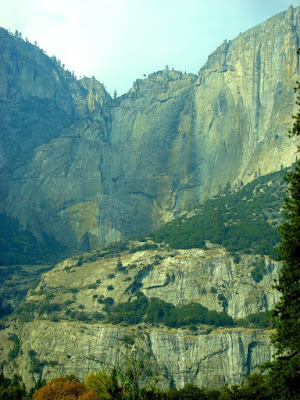 Geotripper: Ironically, I did not spend very long thinking about how I would change the 100 things list, but in the announcement of the Wedge, I had a picture of a deep glacial canyon in the Sierra Nevada of California that was "Not Yosemite". 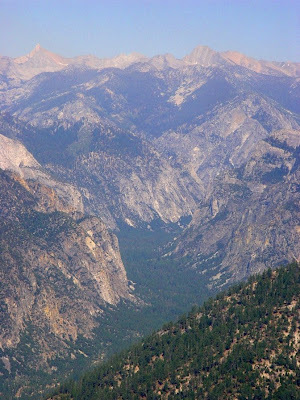 It is Kings Canyon National Park, and it contains some of the most dramatic and geologically instructive scenery in the entire range. Beautiful vertical exposures of granitic plutons, excellently exposed metamorphic roof pendants, highly deformed metamorphic rocks, marble caverns, glacial moraines, hanging valleys, waterfalls, river-cut gorges, and even the occasional exposure of lava flows. And...it is the second deepest (by a paltry 19 feet) canyon in North America. And despite being perfectly accessible, it has a fraction of the crowds of Yosemite National Park (which I also love, by the way). Now, click your heels together, because after all our explorations of the big wide world, Kim, at All My Faults Are Stress Related, has one of the great ideas of the wedge this month: to appreciate the uniqueness and beauty, no matter where you live, of the ground beneath your feet. She makes a great argument: every place in the world has a geologic story, and it is almost invariably a fascinating adventure. It's been an adventure hosting the Wedge this month, and I deeply appreciate everyone's contributions. If I have missed any, please let me know and I will add your contributions. You have added a lot of ideas for us to all think about as we map out the arc of the remainder of our lives. Looking over these lists I found myself thinking: Is one life enough? No, not mine (I wish...). 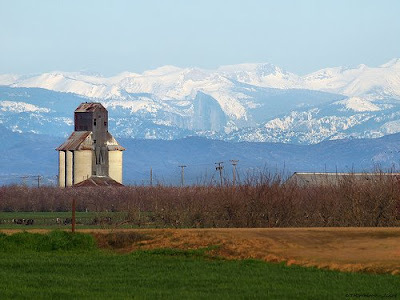 This was taken by Tony Immoos following a discussion on the Yosemite Blog (here and here) about whether Half Dome in Yosemite could be seen from points in the Central Valley. Follow this link (please!) for an explanation of how and where he got this photograph. The picture also includes a portion of El Capitan, Sentinel Dome, and Clouds Rest. 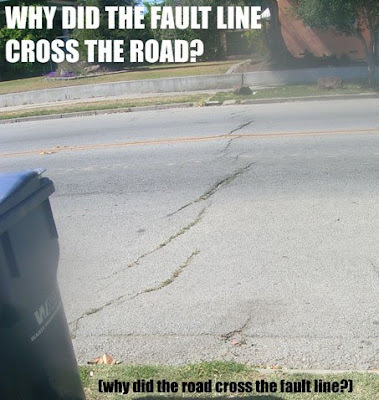 Living in the Central Valley is an exercise in frustration sometimes. One knows that there are spectacular mountains out there, only a few miles away, but it is a rare day that we see them, and few (even among long-time residents) realize that some of the iconic cliffs and peaks of Yosemite Valley are actually visible from the floor of our valley. Far too often it is dust and smog that obscures the view. Are Republicans Really Suggesting This? I didn't begin blogging for political reasons, but every now and then I hear a politician say something so ludicrous, so ignorant, that I feel a need to comment. Especially in reference to geology and geological hazards. Louisiana governor Bobby Jindal gave the Republican response to President Obama's speech tonight, and and suggested that it was a waste of taxpayer of money to spend "$140 million on something called volcano monitoring". If you don't really know a lot about volcanoes in the United States, follow the link for an effective explanation. In a nutshell, the U.S. has the third highest number of active volcanoes of any country in the world, including several that are uncomfortably close to major population centers. This month alone, activity began at a volcano near Anchorage, Alaska. And has anyone forgotten what happened at Mt. St. Helens in 1980 (pictured above, along with Mt. Adams in Washington)? The volcano was also erupting from 2004-2007. I am appalled at the scientific ignorance displayed here; perhaps Mr. Jindal (of Louisiana, as you may remember) thinks we could also save money by turning off the weather satellites that monitor hurricanes in the Caribbean. I mean, really, what are the chances of a hurricane hitting the Louisiana coast? Immediate Update: Green Gabbro is on the topic already....ditto, I say. Waterfalls are an aberration of nature, a temporary interruption in the regular scheme of things, if we are to accept the models of the geomorphologists. Waterfalls don't get much respect from us geologists it seems, since a brief review of the relevant chapters of my textbook reveals little about waterfalls, except as decoration for the chapter cover photos. The chapters I looked at had literally no mention of waterfalls except as deviations from a graded condition. "Graded"? Rivers adjust their channels in such a way as to remove irregularities by eroding "knickpoints" or depositing sediment within depressions. Following the dictates of physics and gravity, rivers are constantly approaching, but never quite achieving, a graded condition, in which no unusual areas of erosion or deposition exist. Waterfalls are the ultimate deviation, and rivers work furiously over time to remove them. As such, waterfalls truly are temporary, and we are privileged to see the ones that do exist. 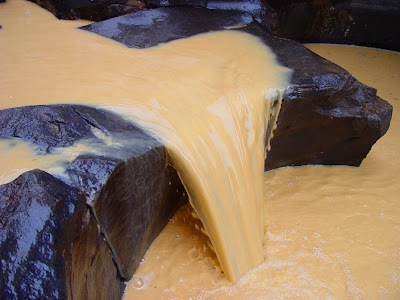 Waterfalls ARE aberrations, and ultimately there is some kind of interesting explanation for why a particular waterfall exists. The river crosses a particularly hard exposure of rock, like a lava flow; glaciers have carved a deep gorge where tributary canyons cannot keep up; water falls off the edge of a plateau with a prominent caprock; a fault has lifted part of a river-course; a landslide has changed the canyon a river flows through. 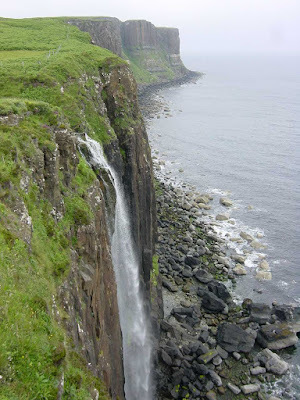 The first photo is Mealt Falls on the Isle of Skye in Scotland. It may be my favorite waterfall on the planet although I have only seen it once and from only one view point. Like McWay Falls at Big Sur, it essentially falls into the ocean. The seacliffs are composed of columnar-jointed basalt flows related to the splitting of Pangea and the opening of the Atlantic Ocean in late Mesozoic time. 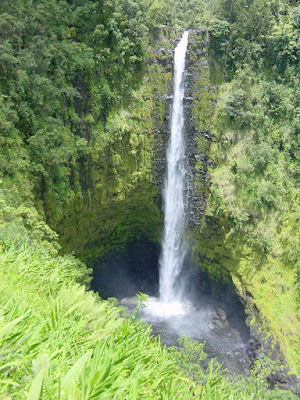 The second photo is Akaka Falls on the Big Island of Hawaii. There are hundreds of incredible waterfalls on the Hawaiian Islands, but relatively few on the Big Island, and none as tall as this one, at 442 feet. The third fall has no name that I have been able to find. I saw it near the town of Bellinzona in the Italian/Swiss Alps, and it left me breathless. It's also my favorite picture of a church! The final photo is in no way an exciting or particularly beautiful waterfall, and it is only 20 feet tall. It's uniqueness is in the location: in the middle of the hottest, driest desert in the United States. 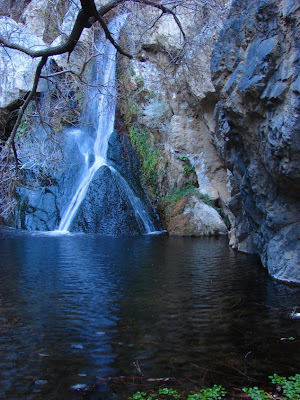 It is called Darwin Falls, and can be found in a remote canyon leading into the Panamint Valley within Death Valley National Park. Somehow the waterfall feels all the more precious, and it is a vital permanent water supply for wildlife from miles around. Have you got a favorite waterfall? Join the meme! If you feel that waterfalls were under-represented in the 100 places meme of a few months ago, you are also invited to make a contribution to this month's Accretionary Wedge Blog Carnival! Submissions due in a few days! Call for Submissions! Accretionary Wedge #16: What Would Be On Your 100 Places List? I'm pleased to be hosting the February 2009 edition of the Accretionary Wedge Geoblogospheric Carnival (#16)! I hope you have some fun with it! The New Mexico plateau country south of Farmington is a barren looking landscape dissected by the occasional shallow arroyo. The treeless terrain is populated by a few Navajo families who graze animals on the arid grasslands. At the end of a 13 mile gravel road, in one of the most isolated and lonely parts of the reservation, one can witness the ruins of Chaco Canyon. For 300 years, beginning about 800 A.D., this was the center of the Ancestral Puebloan universe. The park preserves a collection of some of the most ambitious architectural developments of the Puebloan peoples, with numerous villages of great kivas, plazas and great houses that are unrivaled in their complexity. Some were 4-5 stories high. The villages lay along carefully measured lineations and alignments. Thousands may have lived or traded or worshiped in this shallow canyon. The dwellings included some 200,000 ponderosa beams that had to be hauled from Mt. Taylor or the Chuska Mountains, some 30 miles away. The Great Houses were constructed at the base of cliffs of the Mesa Verde Group, specifically the shales of the Menefee Formation, and the cliffs of the Cliffhouse Sandstone. The canyon was deepened as the soft Menefee was eroded, undercutting the cliffs, which then collapsed into the gorge. This process was recognized by the Puebloans. 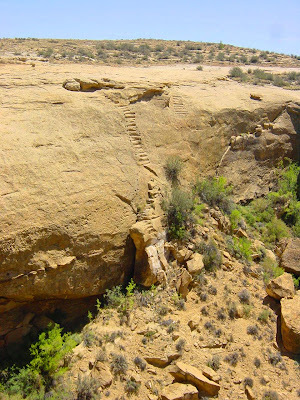 At Pueblo Bonita, the builders had tried to buttress a huge rock that threatened to break away from the cliff, and one could say they were successful, in that the rock did not fall until 1941, when it destroyed 60 rooms in the pueblo. The debris can be seen on the left side of the top photo. The inhabitants of the region were also cognizant of their skies; the cliffs of the canyon contain petroglyphs and and pictographs that may include pictures of the 1054 A.D. supernova that produced the Crab Nebula, and Halley's Comet. The Sun Dagger on Fajada Butte marks the location of a ray of morning sun on the morning of the Winter Solstice. One other remarkable feature of the park are the roads that radiate out from the canyon, pointing in all directions. The roads run in exceedingly straight lines, sometimes for many tens of miles, and sometimes straight up cliffs (see the bottom photo). Rocks were cleared for a width of fifteen feet and more. They are hard to see from ground level today, but are apparent in aerial photos and satellite images. Chaco Canyon is a special place to visit; it is difficult to get there, but is well worth the effort. There is a modest campground, a visitor center, and an interesting network of trails. Check it out! A bit more on Fossil Falls, which was the subject of Friday's Mystery Photo. The falls formed when Owens Lake overflowed during the Pleistocene ice ages. In 2005, we had the unusual pleasure of seeing water actually flowing through the gorge, as we had arrived on the heels of a pretty large storm. The water was rich with silt, giving it the latte-like appearance. Althought the falls are almost always dry, a modern analogue is visible on the Rogue River in Oregon, just outside Crater Lake National Park. The Rogue River Gorge is a pullout on Highway 62 from Medford, about 7 miles from the park. 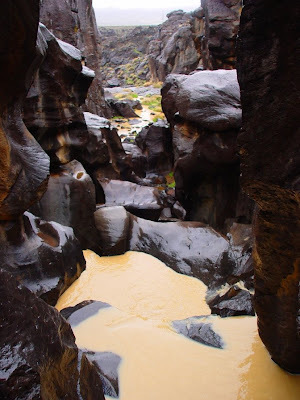 The river flows through a breached basalt lava tube, and is actively forming potholes that are strikingly similar to Fossil Falls. I was gratified by the many responses to Friday's Mystery Photo, and all of you were partly right, in that the photo was in basalt. 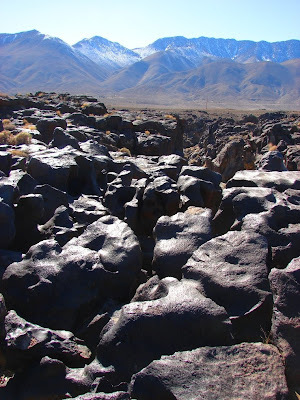 The picture was in fact taken at Fossil Falls near the Coso Range east of the Sierra Nevada (and south of Owens Lake). During the Pleistocene ice ages, Owens Lake filled with glacial meltwater, and spilled over into the valley to the south. The river poured over a thick basalt flow. With all manner of boulders and pebbles to work with, the swirling eddies produced a dazzling collection of huge potholes. The pothole in the picture was unusually deep and narrow, and eventually broke out into the main channel about 9 or 10 feet down. The more energetic and flexible members of our party could shimmy up the tube and climb out. I am about 15 years past being able to do it anymore! The site is not far from the "village" of Olancha, and includes a small undeveloped campsite and restrooms. The falls area was popular with early Native Americans, with stone rings and obsidian work sites, as well as a few petroglyphs in the area. 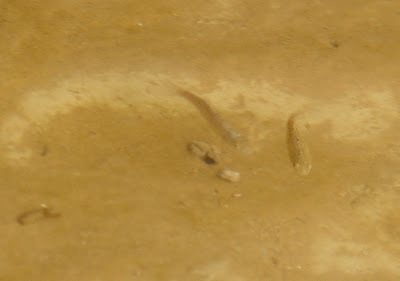 After rains, the potholes also play host to fairy shrimp, who are born, live, reproduce, and die within a period of a week or two. Nearby Red Hill is a classic cinder cone, and numerous cinders and volcanic bombs can be found in the vicinity. The Sierra Crest provides a wonderful backdrop. The pictures above reflect how reasonable the tree mold idea was. Tree molds form when lava flows inundate forests. The lava freezes around the tree trunks, and the trees then burn, leaving behind perfect molds. I have seen tree molds of big Ponderosa Pines on Medicine Lake Highland in northern California, and they are large enough and deep enough (10-15 feet) to climb into. The two molds in the second picture are two branches from one tree, and they merge about two feet down. A mystery photo for Valentine's Day...what's going on here? The opening is looking up towards the sky, and is about 20-30 inches wide. Well, not as bad as it sounds. For the first time ever, Stovepipe Wells in Death Valley National Park has wi-fi. It's as fast as dial-up and cuts in and out, but it is a connection to the outside world! I'm conducting a field studies trip to Death Valley this weekend, and despite some very threatening weather, we've been pretty lucky, dry overnight, and gloriously clear weather today. The pits? 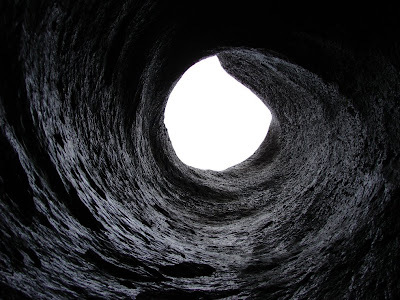 Well, I'm standing at the bottom of a 500 foot deep hole that isn't really a pit, so much as a cryptovolcanic explosion crater. Easy to get down into; a lot more difficult to get out. I was feeling my 50 years at that point! The crater, Ubehebe, formed within the last 2,000 years when basaltic magma approached the surface and encountered groundwater. The groundwater flashed to steam, causing several dozen explosions that pitched cinders and debris in layers up to 50 feet thick. Earlier phreatic (groundwater) explosions occurred at least 7 or 8 times, judging from the number of individual overlapping craters. 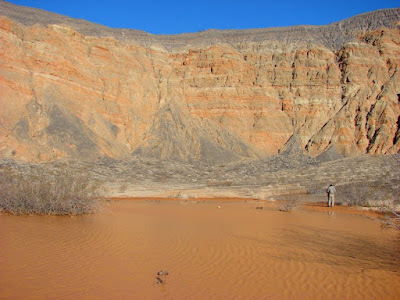 The orange layers are oxidized lake sediments, perhaps caused by the superheated water and steam. 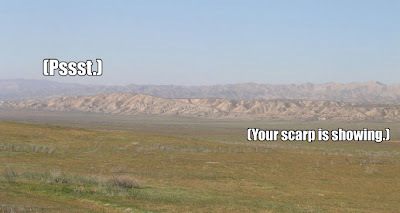 Ubehebe is at the far north end of the paved park roads, about eight miles from Scotty's Castle. It is well worth a look! More later, if the connections here remain stable. I'm off to Death Valley for what promises to be a wet and wild weekend in drought-stricken California. The storm door is open across the state, and I am sincerely hoping that the rain and snow can ease the dry conditions. That remains to be seen, of course. I just don't know why the storms seem to be always coming on the Presidential Birthday weekend when I take the students on our long field trip. In addition to a presidential birthday, it also happens to the be the 200th birthday of Charles Darwin. When I am making my way across the desert in the next few days, I will have a few opportunities to meditate on the intellectual advances that he and Alfred Wallace introduced to the world of science. Like the Ethical Paleontologist, I would like to state here in no uncertain terms that I DO NOT BELIEVE IN EVOLUTION. Of course, I also don't believe in gravity, and I most certainly do not believe in atoms. What I DO believe, especially in the subject area of higher beings, is actually not your business, and is not germane to a discussion about evolution. If you would like a serious discussion about such issues, you are free to contact me in other ways. Of course, despite my professed non-beliefs listed above, the world continues to behave EXACTLY AS IF evolution, or gravity, or atoms exist. My continued existence is in fact possible only because each of these phenomena do exist, and science has provided a framework for understanding each of them. In the case of evolution, my continued existence is actually threatened as I continue to fight off an infection that has proved resistant to antibiotics (don't worry, it's not that serious yet). Death Valley National Park is a place to witness a few incredible examples of evolutionary change in action, both in the past and in the present day. The park contains something like seven vertical miles of sedimentary deposits that preserve one of the most complete fossil records of the development of life from over a billion years ago to the end of Paleozoic time to be found anywhere. The first picture above is a trilobite that same or crawled in the Cambrian coastline around 520 million years ago. Thousands of species evolved over millions of years before they went extinct around 250 million years ago. The innocuous-looking fish in the second photo are cyprinodon pupfish, one of the most unlikely living creatures to be found in the driest place in North America. Sorry for the photo quality; they aren't easy to photograph. The pupfish are the ancestors of a species that lived in the Colorado River system and in fresh-water lakes that filled these desert valleys during the Pleistocene Ice Ages. As the ice ages ended, the lakes dried up, and doubtless many species and individual fish perished, but in a few watercourses and springs a few of the pupfish survived. 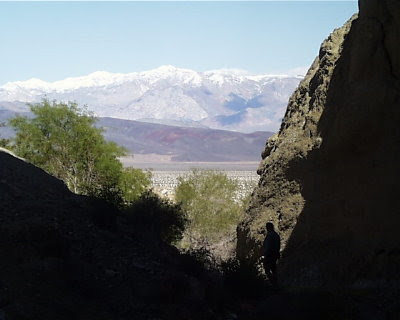 In the last few tens of thousands of years, some of the fish populations thrived in freshwater springs, but others were trapped in increasingly salty ponds and creeks (like Salt Creek on the floor of Death Valley). The fish adapted to the conditions, eventually forming at least four or five species, and perhaps a dozen subspecies. No other fish is known to survive in water as salty as one of the species, and one of the species is known to survive in 100 degree conditions. No other fish is that hardy. Others survive in freezing conditions. The most familiar species is the Devils Hole Pupfish. 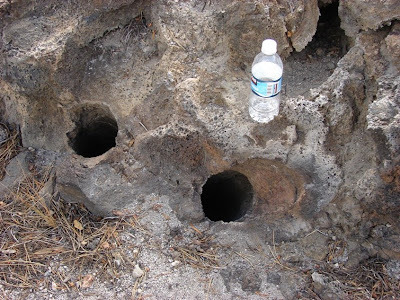 The entire species lives in a single water-filled cavern opening in the Ash Meadows area east of the main park. 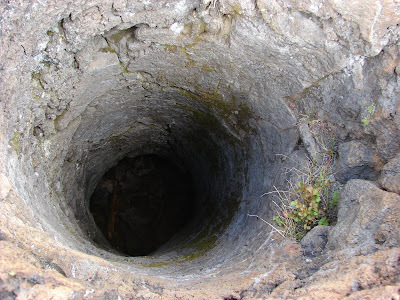 In that one hole, they have survived for thousands of years. Their population crashed a few years ago, down to a few dozen, but they may be recovering (several have been taken to other refugia to preserve the species in case of disaster). They are luckier than the Tecopa Pupfish. The entire species was wiped out in an afternoon when bulldozers destroyed the springs they lived in to build a hot springs spa in the 1940's. What a shame to lose out due to human interence after so many thousands of years. Happy birthday, Mr. Darwin! You enriched our understanding our world in many ways! So...my previous post concerned the horrific drought we are facing here in California, with a third straight year of below average rainfall, less than half of normal in many places. And yet, one place in California has been hit this weekend with way more of the wet stuff than they need, with serious consequences: Death Valley. Death Valley National Park (the climate station at Furnace Creek anyway) is recognized as the driest place in the United States, with an overall average rainfall of 1.92 inches a year (a bit more in the last 30 years, about 2.54 inches). So how many places in the world can you think of that can get half of a year's average precipitation in one day? That happened yesterday at Death Valley, as they got 0.96 inches (on top of about 0.20 inches the previous day). And two more storms are due this week. That doesn't sound like very much to anyone who lives in a more humid climate, but in a desert, nothing holds the water back...no soils to speak of, no plants. Gullies and gulches are filled with loose rocks and gravel that transform into mudflows when water thunders off the barren slopes above. According to the morning report, virtually all roads within the park save one, paved and unpaved, were closed due to flood damage. Six feet of mud covers Badwater Road where it crosses the Gower Gulch alluvial fan. Roads are completely washed out in some areas. So, the place in California best adapted to practically no rain is the one place that has way too much of it. But at least much of the state is due for precipitation for much of the coming week, and maybe we can make a dent in the precipitation deficit elsewhere. As for my own plans, well, anyone want to guess where I am scheduled to take 35 students and volunteers on Thursday? If you guessed Death Valley, you would be right. I wonder how much we will be able to see? One of the nice things about California is that it is very big, and we have alternatives if the roads are still closed. 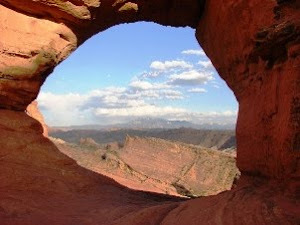 If DV is unavailable, we can check out the Mojave Scenic Preserve, with the giant Kelso Sand Dunes, the Providence Mountains, Pisgah or Amboy Craters (recent cinder cones), and Mitchell Caverns State Park. Anyone with other ideas, I'm all ears! 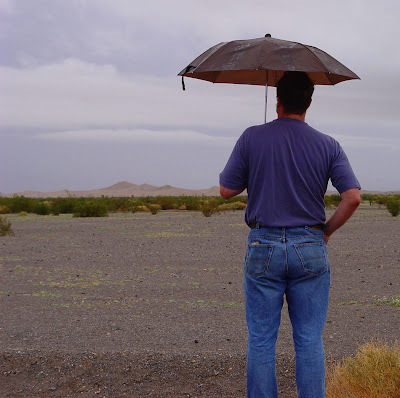 Today's photo is me contemplating rain at Death Valley in 2005, another wet year. The Stovepipe Well Dunes are visible in the distance (picture by Laura Hollister, I think....). During a Drought, What Do You Think About? California is facing an unprecedented drought this year. It's the third dry year in a row, with rainfall and snow totals in the 50% range in the critical Sierra Nevada watershed, which provides something like two-thirds of California's water resources. Some irrigation districts will be tapped out, with no deliveries scheduled for many farmers. Some towns are already rationing water. So what do we think about? Floods. I came across this video by Mark Holloway via the Yosemite Blog of the 1997 floods at Yosemite Valley. The visuals are impressive. On the last day of 1996 the snowpack was much higher than normal in the central Sierra, near record levels . I was camping with my son and his scout troop at a camp along the Merced River down in the Central Valley. The racket inside the mess hall was deafening, so I set up my cot on the outdoor porch, and got ready to bundle up for a cold winter's night. Only it wasn't cold. I was sweating. A big storm was forecast, coming out of the tropical part of the Pacific Ocean, what we term a "Pineapple Express". It started raining, a warm heavy rain that dropped a few inches in the valley, but as much as three feet at elevations as high as 10,000 feet. This rain was falling on the record snowpack, and the rivers started rising...and rising. And all hell broke loose in Yosemite Valley and the other canyons of the central Sierra. A normal spring runoff along the Merced River in Yosemite Valley might amount to 2,000 cubic feet per second. During the height of the flood, the flow reached 24,900 cfs. Large areas of the valley floor were inundated to depths of 6-7 feet, two campgrounds were destroyed, miles of roads were washed away, the sewer system badly compromised, and the Park was closed to visitors for the first time ever (I think; I don't remember when the big federal government shut-down occurred). Downstream, the effects were nearly catastrophic. On the Tuolumne River at Don Pedro Reservoir, the watermaster had some very hard decisions to make. Official flood level for the river at Modesto is about 9,000 cfs. But 130,000 cfs was entering the reservoir, and the lake would be full in 18 hours (usually takes a month or more during normal spring runoff). The decision was made to open the floodgates, and 70,000 cfs was allowed to flow downstream, making this the largest flood event in Modesto history. But the dam held, and only briefly overflowed in an uncontrolled manner. Unlike many Central Valley towns, Modesto is several tens of feet above the riverbed, and so the damage to the town was relatively limited (but terrible enough for the relatively few homes along the river floodplain). There were small ironies. There is a small recreational park on the Merced River at Bagby Grade on Highway 49. Perpetually underfunded, the park lacked certain amenities, like sufficient numbers of picnic tables. Following the flood, the park's ranger found dozens of tables floating in the river. He was ready to utilize them until Yosemite employees caught wind of it and came to get their tables back. The larger irony? As everyone braced for the next horrible storm, only one significant storm came during January (with no damage), and the next month of 1997 may have been the driest February in recorded history. My rain gauge in the Central Valley recorded 0.23 inches in February, and only 0.09 inches in March. April? 0.13 inches. The news and cable outlets were full of stories of flooding in Yosemite, Sacramento and Reno, but some areas were more or less cut off, and some small hamlets in the mountains were too small and isolated to merit much media attention. One of these directly concerned my family, and may be a story for another post. Want to learn more about the floods of 1997? The National Association of Geoscience Teachers, Far Western Section sponsored a field trip to Yosemite in 1998 to look at the flood damage and the effects of several major rock falls. 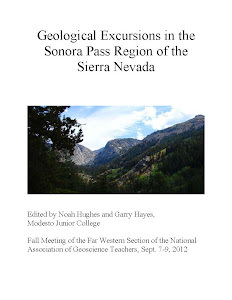 The guidebook is available for sale here (proceeds support academic geology scholarships). An excerpt of the field trip is available on my department website. The top photo, if you don't recognize it, is Upper Yosemite Falls as it appears from about July to October or November in most years. Callan Bentley at NOVA Geoblog has another meme going with the high points of the fifty U.S. states that one has visited. Such a list maybe should also include the high points of the various countries around the world, and maybe that ultimate challenge of the high points of each of the continents. It won't help me much on my list, though. I have a grand total of ....one. Just the same, it was one of the greatest moments of my life, so the title of today's post is a double-entendre. Back in 1975, I had just graduated from high school, and I was off that summer on the great adventure of my life to that point; a 250-mile, five-week trek through the High Sierra, following the John Muir Trail at times but making our own cross-country route at other times. It was a wonderful trip, and as I spent some of those weeks hiking with my brother, my father and a best family friend, it was a chance to reach those first years of adulthood with a new perspective on our family relationships. And the scenery was world-class (oh, how I wish I had a digital camera in my hands at that time; I was rationed to 20 pictures a week with a Kodak Instamatic). The last night of the trip was spent on top of Mt. Whitney, which at 14,505 feet is the high point of 49 of the 50 states (Alaska is in a class by itself). 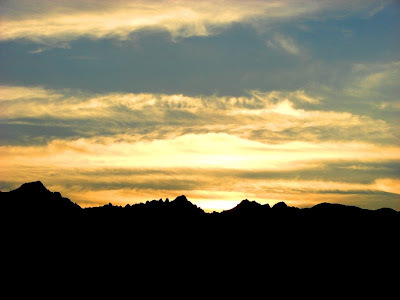 I will never forget waking up as the sky began to glow in the far east, lighting up high cumulus clouds out over Nevada somewhere, and watching the sun rise over the Sierra. It was a great way to end our journey. On a different subject related only by the fact that it originated in the middle 1970's is that I picked up a book by James Michener this last week. Those of you who lived in that time may remember that Michener wrote REALLY thick books that followed a general sort of theme: take a place in the world, and write the story of that place, essentially from the earliest geological development through the first arrival of humans, and then concentrating on one family or group of families leading up to the present day. This was the general idea of his most famous book Hawaii, and I always appreciated how he described the origin of a beautiful volcanic island paradise that grew, eroded and completely disappeared before any human set foot on it. He wrote a book about a fictitious town on the high plains of Colorado called Centennial that followed the same pattern, including an excellent description of the formation of a gold vein, and the life and activities of a dinosaur right up to the moment of its death and subsequent fossilization (and its discovery millions of years later by one of the characters). It was in fact a thinly disguised history of towns like Greeley and Longmont, where my wife's family originated, so the story resonated with both of us (the present-day town of Centennial in Colorado was named after the book). A 26 hour mini-series based on the book was telecast about 1977, which was released recently on DVD, prompting me to pick up my old dog-eared copy of the book. I was once again reminded that as turgid as some of Michener's books could be, his geology was about as good as one could expect in popular literature. Centennial includes a lot of background material on the geology of the High Plains and Rocky Mountains, mining, soil erosion and the effects of drought, especially during the Dust Bowl years with the horrific dust storms, and water-use issues, including the draining of the High Plains Aquifer. So...if you are bored and have a lot of time to kill, check it out! Today's photos include a sunset over Mt. 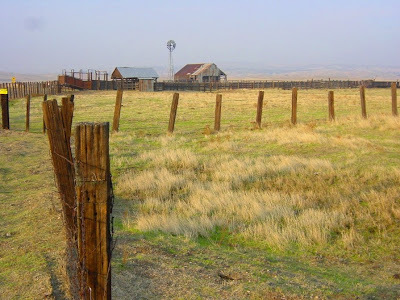 Whitney (just bit left of the center), and a Sierra foothills farm standing in for the High Plains prairie in which the story of Centennial was set.